This is simply wonderful news from Reuters. The world’s first vaccine against malaria has been proven to be effective in clinical trials. 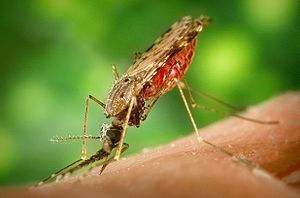 “We would have wished that we could wipe it out, but I think this is going to contribute to the control of malaria rather than wiping it out,” Tsiri Agbenyega, a principal investigator in the RTS,S trials in Ghana, told Reuters at a Seattle, Washington, conference about the disease. Allowing DDT to be used in Africa would also save a lot of lives. At any rate let’s hope that GlaxoSmithKline can get this vaccine to where it is needed most as fast as possible. And, thanks to Instapundit for picking up this story.